This article was migrated from my previous website. 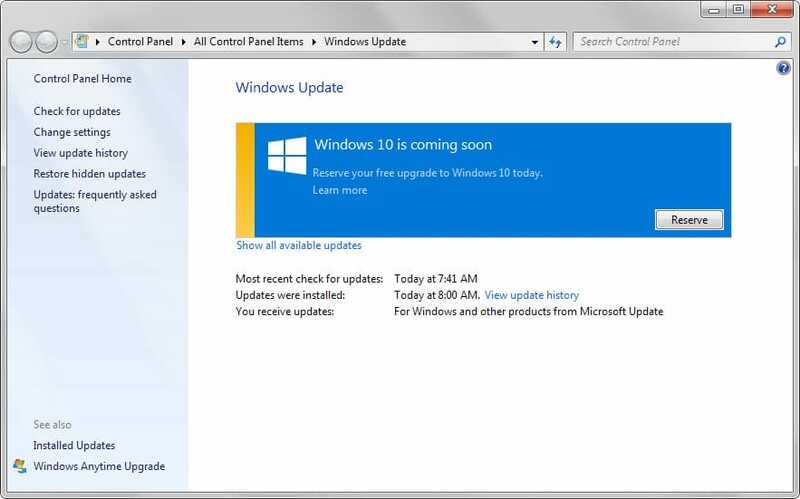 Windows 10 has been released (finally) after a long wait. I have been using Windows 10 for a fair bit of time during its preview state, however my usage of it was always limited to an old laptop - not my primary gaming rig / development machine. With the release of Windows 10, I immediately installed it on my most important computer. This article covers my initial thoughts and reactions and my experience during the upgrade process. Fair to say I was actually counting down the days until the 29th of July, a bit sad maybe but nevertheless the day I was patiently waiting for came and I was able to upgrade my main computer to Windows 10. The upgrade process was not as smooth as I had hoped and expected, although having "reserved" (lol) my copy of Windows 10 a while ago it seemed that it was going to take quite a long time to download. After reading around the web I learned that you can actually manually kick the updater into download mode by typing wuauclt.exe /updatenow into an elevated command prompt, so I did and waited again for the download to progress. Unfortunately for me, every time it prepared to install the update using the "Windows Update" application it failed for an obscure reason. I resorted in the end to downloading the ISO from Microsoft and using that, this seemed to work flawlessly - even though it meant I had to redownload it all again. From starting the ISO download I was up and running in about 2.5 hours, no other problems were encountered during the upgrade. After it finally upgraded I was somewhat disapointed to see that my resolution was set to 800 X 400 and only one of my three monitors was detectable by the computer. However as expected forcing Windows Updates fixed the issue for me, within another 30 minutes my PC was up and running as normal. I like it, not love it. To be honest - beyond a few things its really not that different in the way it works and is used than Windows 8.1. I spent a few hours going and looking and configuring basically everything in the OS, all the settings, looking at all the built in apps etc. No changes would be needed in my workflow to adapt to Windows 10, which is both good and bad. What drove me insane the most in Windows 8.1 was how I would leave the Netflix Metro App running on one monitor while I worked on another. However any window which happened to popup on the Netflix monitor would stop the app from playing. You literally had to open the app back up and ask it to continue playing every time. Now with Windows 10 you can run them windowed like normal applications, so if something pops up over the top - it continue to play. The searching in Windows 10 is very good, you can click start and type anything and it will try to give you results that are relevant (You could do this before but the experience is better and faster). I am finding this more intuitive and better performing than it was on Windows 8.1. Cortana is offering me "Google Now" like items in its feed which I also quite like, hopefully as Cortana gets better it will start being even more useful. In the "This PC" section of Windows Explorer there is a new "Recent Files" section which works differently to the Operating systems that came before. I find this really useful now - it simply shows files you have interacted with recently, but does it well. This combined with the "Quick Access" section being easier to tag and untag folders from makes it so much easier to get to the files you want. I love the Mail and Calendar apps in Windows 10. They have returned Google Sync for Calendars which is huge for me. I just generally love the way they work and look. I have since stopped using Outlook for my personal Mail. However don't try to add your work Exchange email because it wants to hand over control of your computer to your employer! You can see a few changes in Microsofts thinking here, with a way to pay for "Premium" which seems to unlock adverts. Windows 10 is performing great on my main PC, which I should expect as it has some horsepower. But I am under the perception that its working quicker than it was with 8.1 on various tasks. These are great, all of the notifications that come up on Windows 10 now come up in the Action Centre. Its working similiarly to how it does on a phone now, facebook for example lets you know when somebody comments on your posts - you can click on the notification and it opens up the app. Particularly of note - unlike Windows 8.1 if you miss a notification its not gone forever. The Xbox app in general has seem some significant updates. My favaourite though is how you can now press Windows + G in any app and use it to record your screen and audio. OK so I added this to the like section as well, but I was a bit disapointed in the way this worked. When trying to be conversational or asking anything "Off Script" it just offered to serve me web links from Bing. Disapointed, but this is understandably going to improve over time. Did spot a few bugs in the Cortana "Notebook". When configuring your accounts to link to it, it seems to never login - the popups go away but nothing happens. The start menu is also a bit glitchy, often trying to move my tiles around I had to try several times, it didn't seem to "grab" the tile many times, often also it would drop the tiles in ridiculous positions; forcing me to reshuffle it again. Again something I like, but with things I don't like. Quite simply two things I want improved here. 1: Sound / Video playback on one desktop is stopped when you move to another. I want this to continue even on other desktops. 2: If you start an application (IE Visual Studio 2015) on Desktop 2, and then flick to Desktop 1. The application attaches to whichever desktop is open when its finished loading. Annoying. Not a lot to say about the Personalisation options, there are less options available than there were in Windows 8.1 and I don't particularly like any of them. This revolves around the colours you can apply to the taskbar and start menu. They are all too bold or dark. Again a quick one, with 3 monitors at least, this is impossible to hit. Its so small now that its easier to just press Windows + D.
I believe Windows 10 is a worthy upgrade, but do not attempt it yet if you are not very techy. You will likely run into the odd confusing thing and get stuck. However if you are able to overcome some small problems - Go for it.